From what I can tell, deprotonation of the central hydrogen leads to the more thermodynamically stable product (most substituted double bond. i.e. most stabilization by hyperconjugation). 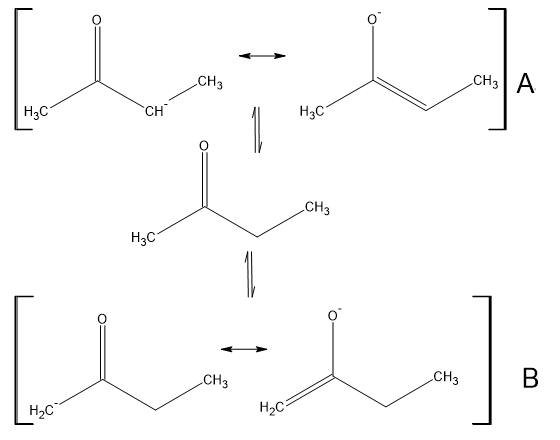 Therefore, if butanone is allowed to equilibriate in the gas phase, I would expect the deprotonated form A to be present in greater amounts than B. Therefore, I would conclude that the pKa of the central hydrogen is lower than that of the terminal one, in the gas phase. How does this change with solvation, and why? I've seen many other posts about ketone deprotonation, but browsing them I have been unable to answer my questions. Refer: "Which enolate of butanone is more stable? ", "Regioselective enolate formation"
Browse other questions tagged organic-chemistry acid-base carbonyl-compounds stability or ask your own question. Why are double bonds at more substituted carbon more stable? Which enolate of butanone is more stable? Why is the pKa (COOH) of alanine and glycine similar but the pKa (NH3) different? Possible Synthesis of MVK from 2-Butanone? How can benzaldehyde have a pKa of 14.9? Why is Acetic acid (pKa = 4.76) stronger than carbonic acid (pKa = 6.36)?